Rwanda’s jails are reducing their energy bills this year by turning inmates’ waste into energy. That’s right, poo power is back, and now 75 percent of the prisons’ energy is fueled by a mixture of human and animal sewage in an effort to make the country’s 14 prisons more sustainable. Biogas burners have been installed, and they are run by the facilities’ constant source of waste matter. At one of the prisons, Nsinda, 8,000 inmates fuel the facility with sewage taken from the 24 available toilets. This is then combined with cow dung to create a premium power supply, and whatever gas is produced is stored in digesters which are maintained by the inmates. Although part of the prison’s energy still comes from burning wood, the facilities are working towards phasing this out altogether in order to be entirely energy-efficient. Sustainable prison projects are nothing new, but Rwanda’s energy systems could very well be a model to be replicated. Some of the prisons have already seen a cost reduction of 85 percent on their energy bills, which could translate to an estimated $1.7 million in savings. It makes sense. Nsinda is just one of the prisons in which 8,000 inmates fuel the facility with sewage taken from the 24 available toilets. This is then combined with cow dung to create a premium power supply. What gas is produced is stored in digesters which each hold 100 cubic meters of biogas and are maintained by the inmates. 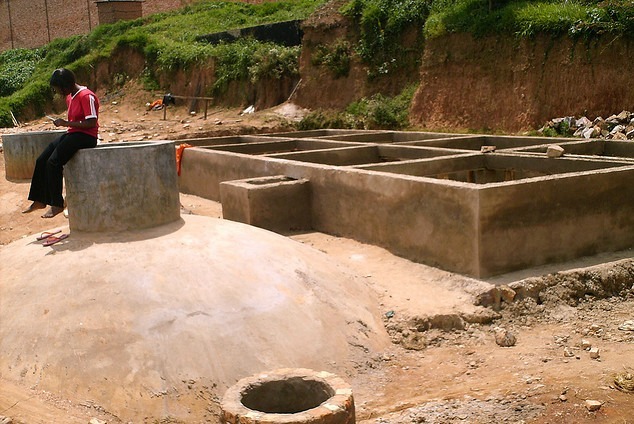 Rwanda's jails are reducing their energy bills this year by turning inmate's waste into energy. That's right, poo power is back and now 75% of the prisons energy is fueled by a mixture of human and animal sewage in an effort to make the country's 14 prisons more sustainable. Biogas burners have been installed and are run by the facilities' constant source of waste matter.